McKelvey’s experiment was a success and he and his partner moved on to found WeWork, a shared office community now with three locations in New York City, one in San Francisco, and another soon to open in Los Angeles. McKelvey is not alone in his quest for a better work environment. The American workforce is changing and workers are seeking new ways to address their evolving needs. “Contingent workers,” such as freelancers, temps, part-time workers, and contractors, will make up more than 40 percent of the U.S. workforce by the end of this decade, according to the Intuit 2020 Report, a study conducted by Emergent Research in partnership with Intuit Inc. The report also states that “more than 80 percent of large corporations plan to substantially increase their use of a flexible workforce in the coming years,” and the numbers of self-employed and microbusinesses are on the rise. Many mobile workers take refuge in coffee shops to escape the isolation of the home office or clutter of the kitchen table—but even Starbucks has limitations. So, thanks to some forward-thinking entrepreneurs, like McKelvey, new options are becoming available. Shared-office environments, designed specifically for this contingent workforce, are popping up in cities large and small, but they’re not your typical office spaces. These new workplace environments are part of a movement called coworking, where independent workers share flexible, furnished spaces to create community and promote collaboration. And the cost is much less than renting a traditional office, with average monthly membership prices ranging from $195 for an unassigned workstation used on a drop-in basis to $387 for a permanent desk. 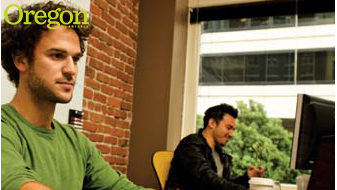 Coworking emerged in the United States in the late nineties among the tech crowd. “In the wake of the dot-com bust, the idea sputtered, but lost its footing,” according to Deskmag, an online magazine about coworking. It made a comeback in 2005, and really got going a couple of years ago. “The movement has roughly doubled in size every year since 2006,” the magazine reports. 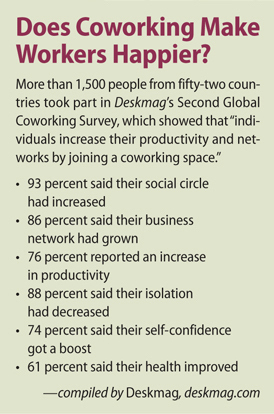 The latest Deskmag survey found that there are now more than 1,100 coworking facilities worldwide. Ryan Coonerty ’96, cofounder and chief strategist of NextSpace in Santa Cruz, California, sees coworking as more of a revolution than a trend. “We believe we are going through a once-in-a-century shift,” he says, “a revolution not unlike the Industrial Revolution or the Technological Revolution. Companies will seek independent workers depending on the project,” he predicts, “like movie studios change their actors every movie.” But to do that, you have to create the infrastructure. When Coonerty got involved in the coworking movement, he was mayor of Santa Cruz and looking for a way to jump-start the local economy. “One day [the city council members and I] were sitting in Starbucks and noticed how many people were working there,” he recalls. “We started to think that instead of attracting one 200-person company, we could get 200 one-person companies.” A coworking space could help make that happen. NextSpace launched in October 2008. A year later, a second location opened in San Francisco, followed in 2011 by others in Los Angeles and San Jose. Coonerty hopes to open another four to six coworking spaces by the end of this year. There seem to be as many reasons for coworking as there are coworkers. Margaret Rosas, founder of Quiddities, an Internet consulting agency, was one of the original members of NextSpace in Santa Cruz. She is a strong advocate for working locally and using local talent. She sees coworking as “an interesting exercise in being collaborative instead of competitive.” Since she’s been at NextSpace, she has rented offices of varying sizes to accommodate her growing business. Now she is changing her membership again—closing her company and going to work for a tech firm. But she’s not leaving NextSpace. She will move to a “café membership,” which will allow her to use the open, café-style workspace and still have access to all of NextSpace’s resources, including conference rooms, office machines, and access to other NextSpace members through an online network for immediate collaboration and assistance. This fluidity is a big part of coworking’s appeal. “It makes it incredibly easy to just start tomorrow,” Rosas says. Sandy Skees, CEO and founder of public relations agency Communications4Good, was working out of her home when she found NextSpace. “I was looking for a community, and the ability to collaborate with graphic designers, etc.,” she says. “NextSpace was rich with helpful, smart, engaged people.” They even have a staff member whose job it is to facilitate collaboration. For example, “they might be talking to a new member whose company is just getting ready to launch and they need a PR person, and off we go,” she says. “Once you get comfortable here, this stuff happens organically all the time.” Some large, some small; recently, she says, a member left her iPhone charger at home, so she sent out a request to the online community and within seven minutes she had three people standing in her doorway offering to lend her a charger.